Previously there had been a split import between the different marques to Germany. For the Austin/Morris range there will still be the same import company A. Brüggemann & Co.
car lines. 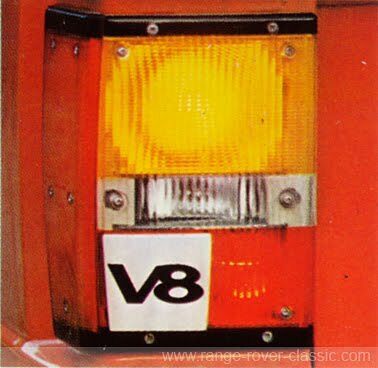 ", which mean that Range Rover also will be sold through A. Brüggemann's. 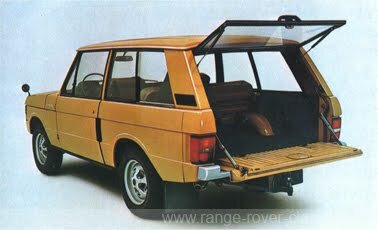 The Range Rover is undoubtedly an extra-ordinary car. It is an all-purpose vehicle that combines the legendary robustness and versatility of the Land Rover with the comfort and the loving detailed design of the Rover saloons. The car body styling we may well regard as successful synthesis of uncompromising modernism, more elegant styling and absolute expediency. Here are some examples of its many uses: a comfortable high performance car for long travels and expeditions, a stable and robust off-road car, ideal leisure vehicle that is equally as useful in terrain as on the highway. 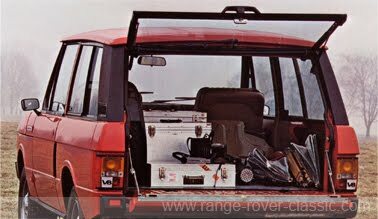 In all these occasions it can carry 5 passengers and 325 kg of luggage or 2 persons and 550 kg of luggage. This car for the future is driven with the familiar 3.5 liter V8 aluminum engine that is installed in the Rover luxury sedan. The motor power can be used by a total of 8 forward and 2 reverse speeds for every need. are a small selection of all standard equipment. 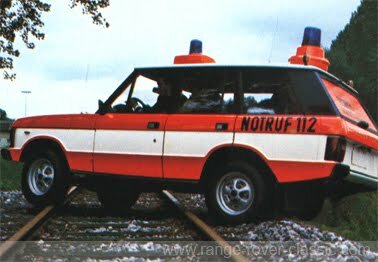 In 1974 the first Range Rover rescue vehicles were delivered to fire and rescue services i Germany. 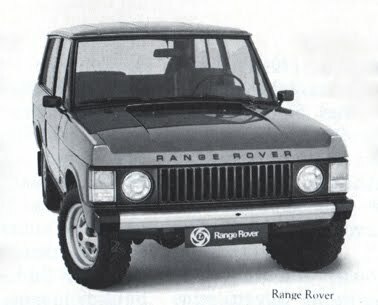 vehicle like the Range Rover had of value to save injured people in traffic accidents. on the ground with large numbers. 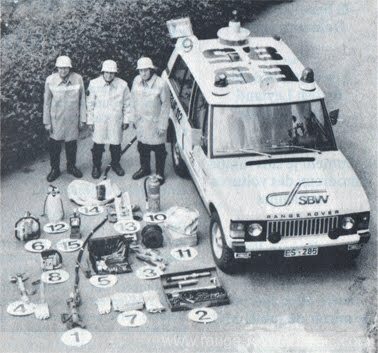 Number 1 is a hydraulic steel cutting tools to chop injured people out from crashed vehicles. A powerful V8 engine with 132 hp and 4 wheel drive, there is no problem to overcome small obstacles and drive in open terrain. of the Rover saloons in itself. The body styling we may well regard as successful synthesis of uncompromising modern, elegant lines and absolute convenience. 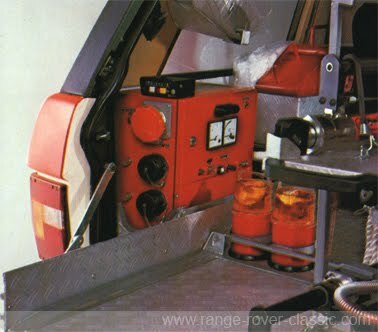 that is installed in the Rover luxury sedans. The engine power can be used by a total of 8 forward and 2 reverse speeds for every need. All-wheel drive, switchable differential lock, 4 disc brakes with servo assistance and an automatic level control are examples of the Range Rover's standard equipments. The Range Rover is now no longer a secret anymore and not only connoisseurs appreciate him. 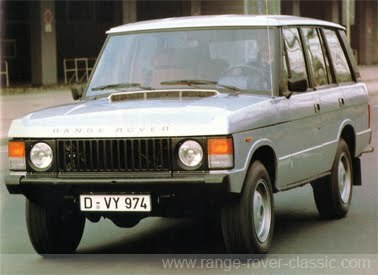 The worldwide reputation of the Range Rover is not a coincidence, but has been justified for many reasons. 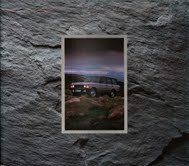 The Range Rover is more than just a leisure car with off-road look. It is rather the successful synthesis of a technically advanced, all-wheel drive in every kind of terrains, high capacity on payload and towing in one hand and a convenient, fast and sophisticated sedan on the other. 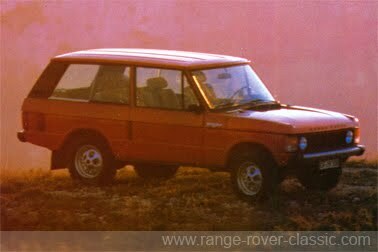 That the Range Rover do not deny its British origins may be, just another plus point and is documented in his appearance: Sober, objectivity free of unnecessary extravagance, practical and yet elegant, functional and clear evidence of a forward-looking and to its details in the well thought-out design. 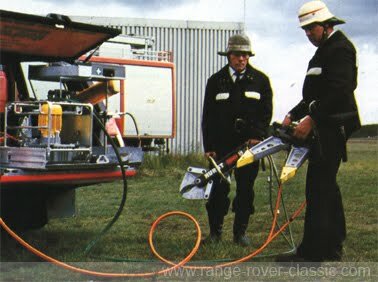 Many years of experience from the Rover-engineers in the construction of terrain vehicles and sedans, perfectionism in the development of the compact, high performance aluminium V-8 engine, without superfluous gadgets and the desire to provide maximum riding comfort, safety and spaciousness not only in everyday use, but also provided for the most difficult off-road use, made the Range Rover to what he is today. A pioneering multi-purpose vehicle that can make driving to an adventure on 4 wheels. A vehicle which is different from the normal everyday vehicles in a sovereign and impressive manner. The real luxury of this all-wheel drive vehicle is the wide range of its possible application speeds that can hardly be desired. 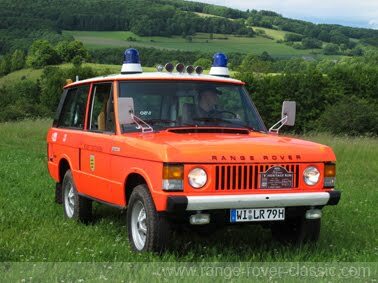 Whether you're planning to pave your way through dense undergrowth, climbing steep mountainsides with up to 70% slope or want plow through knee-deep mud holes, where the water hits at seat height on the doors ... no problem for the Range Rover. 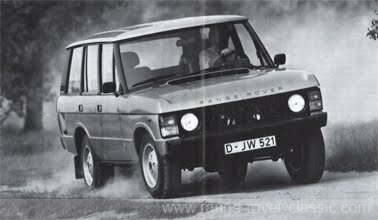 For such a high altitude of the Range Rover with permanent four-wheel drive, a switchable transfer gearbox. The transfer ratio gears can be drastically reduced and really increase the pulling power. At steep downhill with max. 15 km/h it is sufficient to use the braking performance of its engine. In aid to keep the brakes to be calm and prevent sliding down muddy slopes. 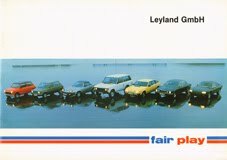 On swampy grounds, the switchable central lock which acts on the center differential in the middle of the vehicle, make a further increase of the traction. In agriculture and forestry, but also in road construction areas the Range Rover is the superior way to take you to your destinations. Wet meadows, deep arable ground, clay, rocky soil and loose rock, it coped easily as on the road. 3.5-liter aluminum engine and thus makes the exceptional towing capacity of 2000 kg possible. with the exception of two countries? 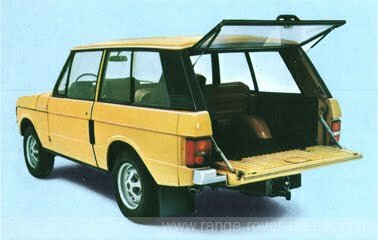 With the substantial loading capacity of 700 kg the Range Rover offers in the luggage compartment behind the large tailgate and thus makes it especially useful for small entrepreneurs as an economical and interesting object. The level control on the suspensions rear axle ensures constant vehicle height even when fully loaded. 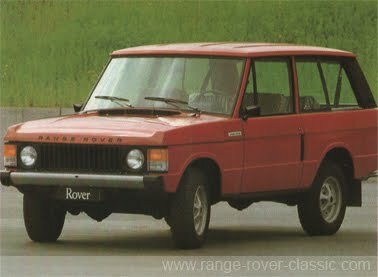 The advantage of an equal limousine like ride and with high suspension comfort, proves the Range Rover especially when driving under different conditions and to this day the Range Rover remains unmatched. A good balance and tuning of the suspension allows a comfortable pace off the trail and count for that the occupants are protected from unpleasant bumps and knocks. The special front and rear suspension on rigid axle, telescopic shock absorbers, coil springs gives greatly contributing to the sedan-like comfort and impressive driving condition. force on the drum of the rear drive shaft handbrake in a car of this category a given. A view into the interior of the Range Rover will convince the most demanding buyer in every aspect. 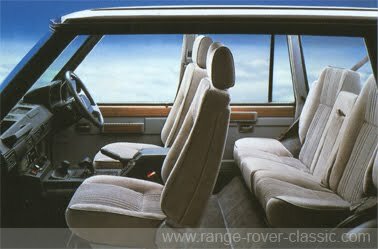 Clean processing, functionality, spaciousness and refined, not least the comfortable front seats are some typical characteristics. 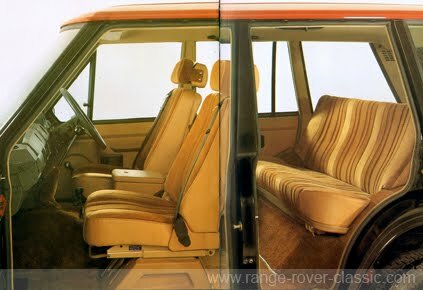 Along with the wide rear seat bench 5 people have easily room in the Range Rover. 30 years of experience from the Rover specialists give an interior and facia for many details that are easily recognized. Switches, levers and large dimension tools are practical and easily found in accessible places. large windows area located from almost the waist level belt height. Favorable exterior dimensions, large windows and two exterior mirrors and the standard rear wiper with electric washer allow a perfect view of the road ahead. High torque at low engine speeds provides maximum torque of 251 Nm at 2,500 rpm. Especially under the off-road conditions it prevents this pulling power and a continuous power output, aided by the constant four-wheel drive to prevent to getting stucked or the wheels from spinning. radial-flow gasifiers are more characteristic features of this powerhouse. their holidays, the nimble small car for city driving and the prestigious coupe to their individuality. 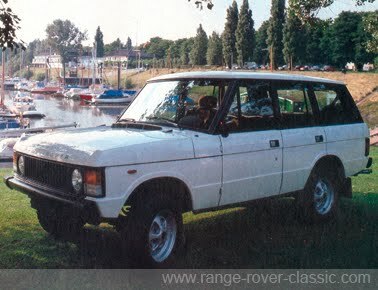 But that it is the Range Rover S, the all in one vehicle, they do not seem to know. 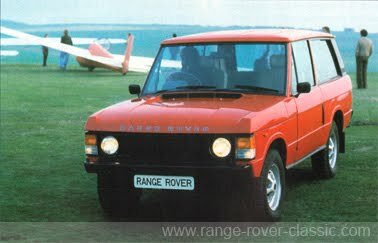 And the Range Rover S is a no compromise concept. Take a first look under the bonnet! The 3.5-liter V8 aluminum engine is extremely powerful, with 97 kW (132 hp) at 5000 rpm. He draws from idle and reaches the maximum torque of 251 Nm at 2500 rpm. That is the power needed for a good working for a terrain vehicle to effortlessly move forward, where others get stucked long ago. And with a cruising speed of 160 km/h, it is well impressive even on the highway. If you are showing the other vehicles your tail lights in the city traffic, this should not come as a surprise with an acceleration of 14.5 seconds from 0-100 km/h. Sand. Snow. Mud. Forest. 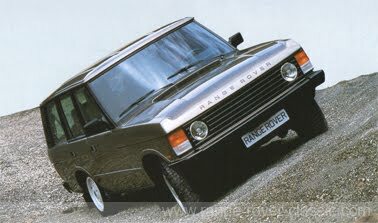 Range Rover S is ideal. center differential. Even gradients up to 70% climb effortlessly. less than 8 forward and 2 reverse gears. If it is impassable - because the Range Rover S feels comfortable. And you also. For the carefully tuned suspension swallow effectively nasty bumps and shocks. by which you chauffeured Range Rover S over hill and dale without stiff exit. Not to mention the standard automatic leveling device that maintains the suspension characteristics either loaded or not. Whether to transport for your party or bringing your surfboards, Safari equipment and boat trailers - the Range Rover Sport S has just level. Walking speed in heavy traffic celebration evening. Weekend on country roads. On vacation hairpins on the pass road. With the Range Rover S a pleasure. Needless to say that rich instrumentation, grippier switches and levers complete the attention to detail. He must have just gone. Get on board. Experience the Range Rover S.
hard daily work, without compromising on refinement and style. A 'wolf in sheep's clothing', an attractive vehicle that even under the harshest conditions, do not loose its attractiveness. Robust, without being clumsy. Comfortably, without having to give away roadholding. Attractive design, without sacrificing functionality. Alloy wheels in the four-door version with numerous high-quality detailed features such as, carpeting throughout the foot and boot areas, seat belts front and rear, tinted heat-insulating glass all round, and with metallic paint and air conditioning as optional equipment, Range Rover proves again its immensely socially acceptable appearance. With its voluminous cargo hold of max. 1670 liters capacity he swallow incredible loads, up to 700 kg. Easy to load with the split large tailgate, the lower part can be folded horizontally; creating a picnic table or as a standing platform at the horse competition arena. 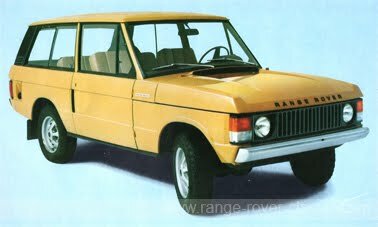 Whoever is used to accept that off-road vehicles have loud engine noise, energy-sapping controls and knock hard suspension, will easily run the risk of underestimating the Range Rover. 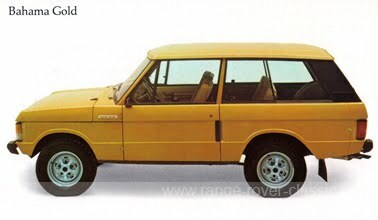 But with all-wheel drive, differential lock and selectable reduction gear, capable to manage gradients of 45 degrees, the standard Range Rover outperform many off-road vehicles. 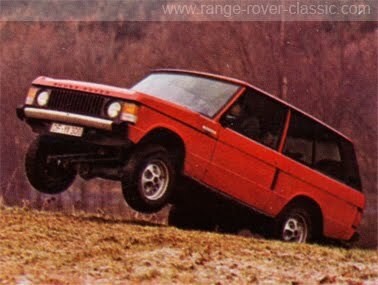 The Range Rover does not fear competition. Especially not on the highway, where he achieves a top speed of about 155 km/h easily, thanks to muscular 126-hp 3.5-liter V8 light-alloy engine. Encouraging that the fuel consumption in both models with the slightly modified engine can be reduced by around 20%. 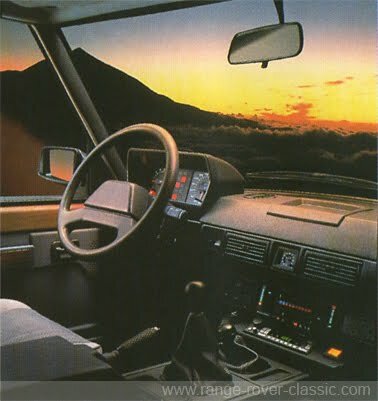 As an absolute necessity to master the variety of terrain conditions, proved to be permanent all-wheel drive, which provides in difficult terrain for optimum pulling power. To enhance traction and to overcome all the problems in the field, it has a third differential between the front and rear axle, which can be locked. In this way, the continuous power transmission is ensured on both drive axles. The Range Rover, a vehicle that makes adventure driving possible. 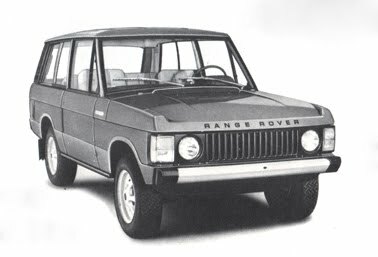 Range Rover available in 2-door or 4-door versions. The 4-door version selectable with either 5 speed manual or 3 speed automatic gearboxes. 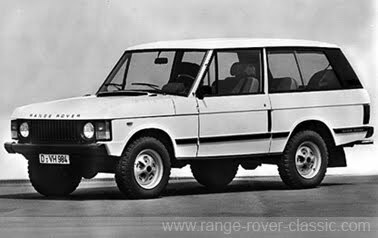 With the Range Rover to its designers had made ​​a particularly difficult task: You should design a car that is in rough terrain, climbing ability and reliability is also a new benchmark in terms of build quality, design and comfort. 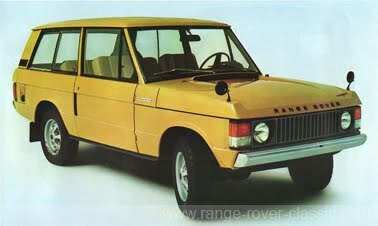 The crown of the program range is the new 4 door Range Rover with automatic. This new transmission count for that the driving of the Range Rover has become a lot more comfortable and effective, without having lost any power or road performance, even the off-road performance is unaltered. Actually, in addition to the increased ease of use, the advantage of automatic gear changes shows, especially when it comes down to the difficult terrain to choose the right 'gear' or in extreme cases, as well as ice and snow to ride safely and gently. The same applies in the high speed running. 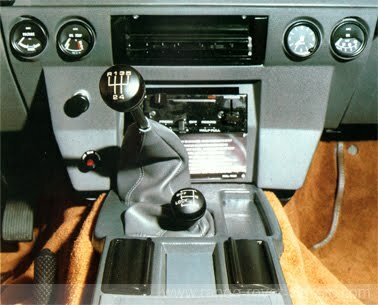 The 3-speed automatic transmission is combined with a new high-performance transfer case, which can be switched with a combined reduction gear lever and center differential. A transmission oil cooler ensures the correct operating temperature of the oil. 2- and 4-door, gives now ten forward and two reverse gears. transmission speed reduction and reduction of the noise level. All this are attributes that make driving in the new Range Rover to be more comfortable and more enjoyable. 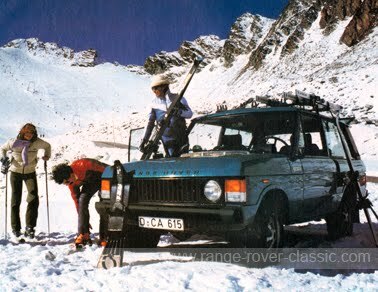 Range Rover has proven its efficiency in more than during adventurous challenges. Most recently at the Camel's Trohpy '83 - 1000 miles deepest Africa and '84 - 1000 miles in wild America. the adventure jungle trails, then the local conditions are not a problem. The Range Rover with its 93 kW/126 hp 3.5-liter V8 engine with all-wheel drive is a guarantee. It's just fun to drive the Range Rover - not because of the seriousness in your daily work, but to provide first, quick help. But even when it's good to know that you can rely on a vehicle that will take you anywhere, to enable first aid fast. working height mounted on the loading platform at hand. Option 3: With a power take-off on permanently installed generators with 5kVA. Its remote control box is provided with sockets for easy common AC (2x) and phase (1x). In addition, a rack for the telescopic pole is installed. 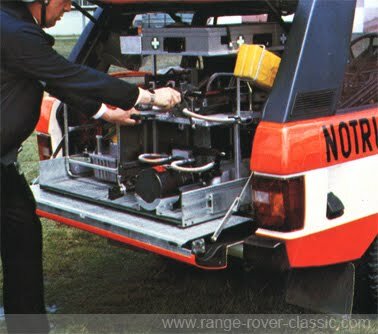 Option 4: For the first fire fighting operation with a powerful HALON, LIGHTWATER or POWDER-extinguishing system, which is housed within easy reach in the rear of the Range Rover. Option 5: With the help HURST performance kit, spreader SP 45 or SP 30, Cutter S150 including accessories according to DIN 14751 Part 1 +2. 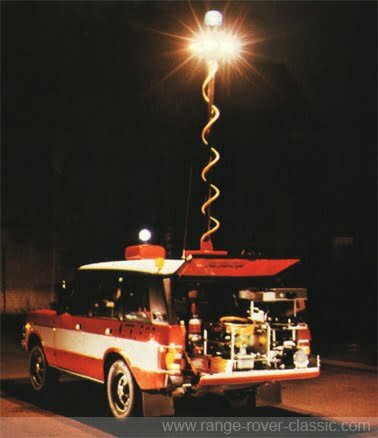 Option 6: with sufficient light in the dark in order to work and help you. This helps a STEM-LITE telescopic pole for STD applicances, command and advance equipment vehicle, armored personnel carriers, equipped with halogen lamps 220V/2.000 wattage. , Create an all-beam up to 60 m in diameter. The mounting height is 4.60 m. Optionally, a rotating beacon becoming incorporated. 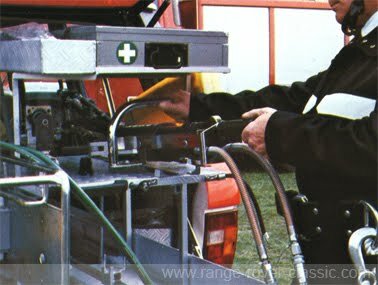 Range Rover advanced rescue vehicle - a real partner for first aid fast. 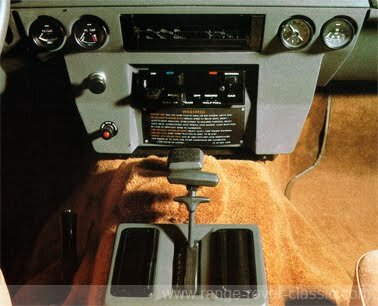 5-speed manual transmission (fully synchronized).